Relegation-threatened Southampton threw three crucial points away after an eight-and-a-half minute collapse saw Chelsea fight back from two goals down to win 3-2 at St Mary’s. Dusan Tadic’s opener and Jan Bednarek’s neat finish suggested Saints might seal a shock victory to temporarily move out of the bottom three, but the introduction of Olivier Giroud changed the dynamics of the game. A brace from the former Arsenal striker and a 12th league goal of the campaign from Eden Hazard completed a shock turnaround, which could prove decisive for Mark Hughes’ team come the end of the campaign. While Antonio Conte’s side have kept their slim hopes of breaking into the top four alive, Southampton are now five points adrift of top-flight safety with only five games to go. 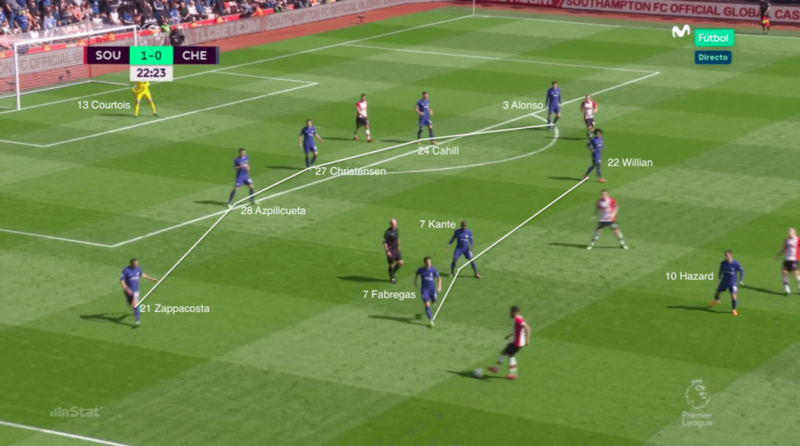 Southampton matched Chelsea’s 3-4-3 system. Jan Bednarek, replacing the suspended Jack Stephens, was handed his Premier League debut in a back three – the only change from their defeat to Arsenal. 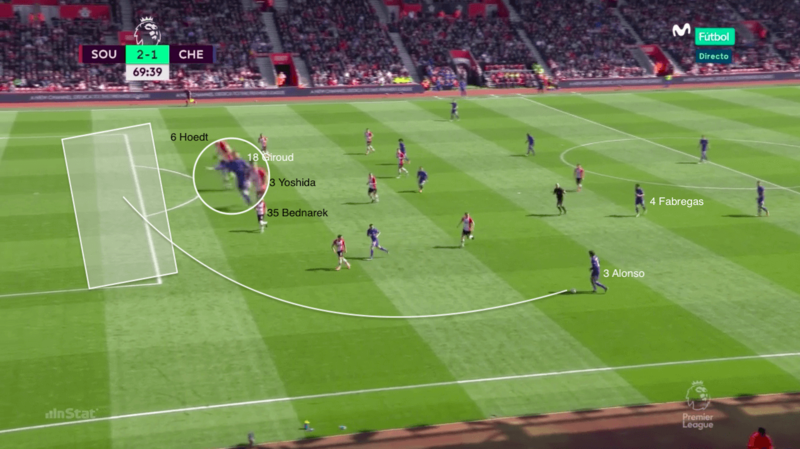 When defending, Southampton set up in a 5-4-1 low block and disrupted Chelsea’s desire to settle on the ball with aggressive pressing. They established a strong central block and used the possession of Chelsea midfielders Cesc Fabregas and N’Golo Kante to their advantage. 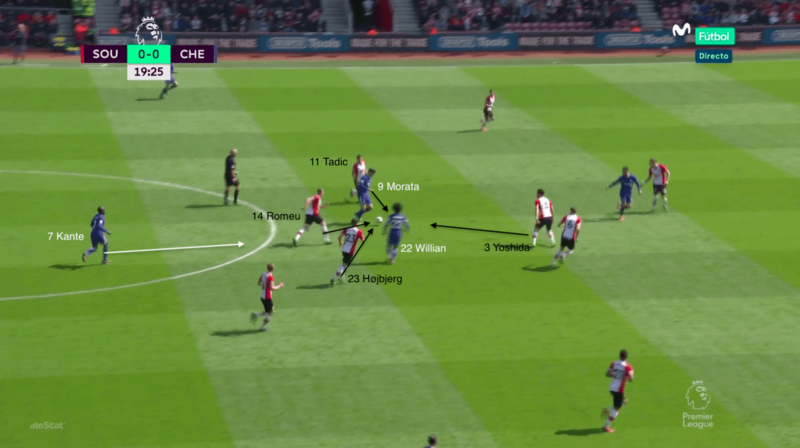 Rather than move players out of key central areas to apply pressure, which would open space for attackers Eden Hazard and Willian, the pair were afforded time on the ball. 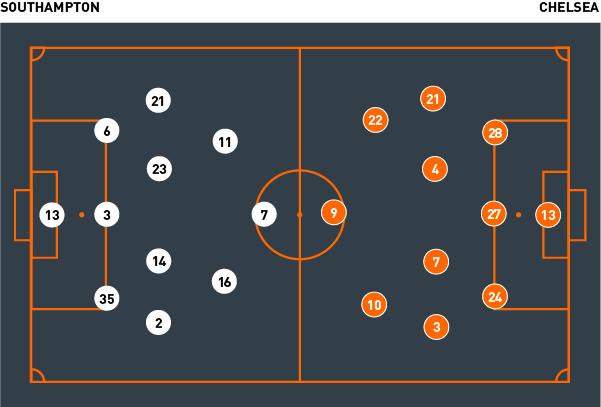 Southampton instead focused on controlling the offensive areas. 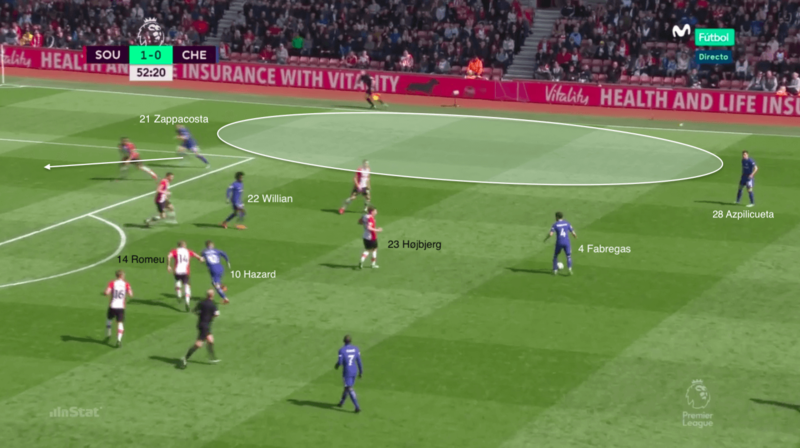 Fabregas and Kante were consequently forced to pass into these marked zones, where Pierre-Emile Hojbjerg and Oriol Romeu were effective in intercepting or pressing Hazard and Willian. During the transition, Southampton looked for striker Shane Long. Long used his experience and physical presence to hold the ball and bring in Dusan Tadic and James Ward-Prowse in supporting attacking positions. The Saints’ switch from a low block to building purposeful attacks, which also allowed the team to rest when in possession, was key to their control of the game in the first half. It was out wide that Southampton caused structural problems for Chelsea, particularly down the left-hand side. Cesar Azpilicueta was often pulled out of Chelsea’s back three to prevent an overload on the left – and it was here that Southampton saw success in scoring the opener. 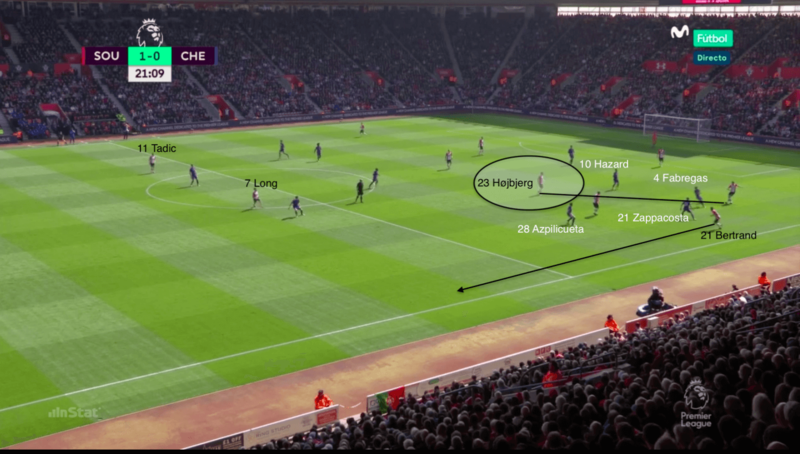 Hojbjerg received the ball on the half-turn in his defensive half and, unpressured, his releasing of Ryan Bertrand down the left resulted in Azpilicueta being dragged out wide to defend one-on-one. With the Chelsea defender beaten for pace, Gary Cahill and Andreas Christensen were left in a two-versus-two scenario with attackers Tadic and Long in the box. Tadic utilised the space to comfortably slide in the opening goal. While Chelsea began to take control of possession in the second half, Southampton remained disciplined in a well-structured defensive shape and effective in transitions. Again, it was poor Chelsea defending that saw Southampton double their lead. Chelsea set up in a zonal marking system as Ward-Prowse delivered a free-kick from wide right into the box on the hour mark, but Marcos Alonso was caught ball-watching at the far post, allowing Bednarek to finish on the volley. After conceding the second goal, Chelsea manager Antonio Conte immediately made a double substitution, and the shift in momentum was obvious. Southampton had been in control for 70 minutes, but a lack of focus from a quick Chelsea free-kick saw substitute Olivier Giroud take full advantage of Southampton’s back three not being set. Southampton, rattled by relinquishing their two-goal lead, now dropped deeper and lost their composure in transition, often failing to retain possession and thus build counter-attacks. With momentum on their side, Chelsea capitalised on Southampton’s vulnerability, scoring two more goals to complete the comeback within eight minutes and denying their relegation-threatened opponents three vital points. 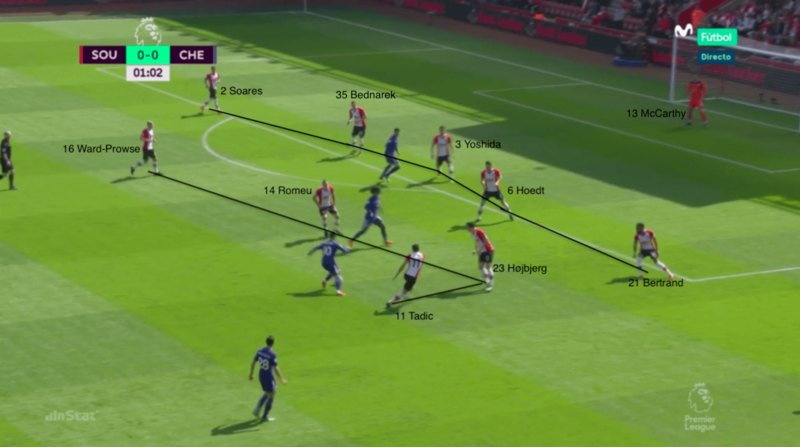 Southampton’s defensive block contained a tight, compact back five and midfield four, which worked closely to deny Chelsea space in central areas. Chelsea’s options out wide were also limited for much of the game. N’Golo Kante receives the ball with no pressure, but Southampton players press Alvaro Morata after the pass is received. They used this ball as a trigger and often countered after regaining possession. Here, Tadic wins the ball and sets off the counter-attack. 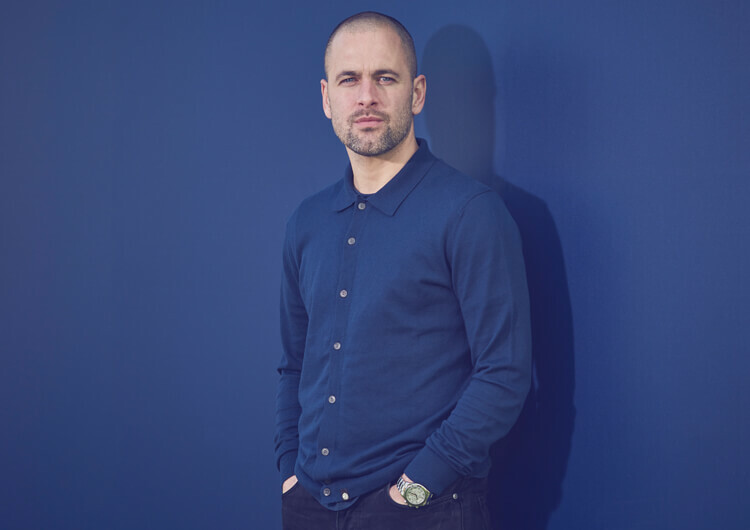 In the build-up to the first goal, Cesc Fabregas’ pressing is feeble, with Southampton midfielder Pierre-Emile Hojbjerg afforded the space to turn and find the run of Ryan Bertrand. Chelsea lacked conviction when pressing high in the first half. Dusan Tadic scores after Ryan Bertrand beats Cesar Azpilicueta one-versus-one for pace, and Marcos Alonso is slow to recover and help Chelsea’s two central defenders. Shane Long’s movement draws the defenders in and Tadic drops into the space. 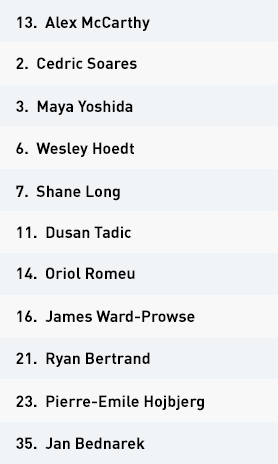 Shane Long competed well with long balls forward, with Dusan Tadic and James Ward-Prowse offering support. Here, Long uses his strength to beat Azpilicueta, and Tadic and Ward-Prowse run in behind. Davide Zappacosta and Marcos Alonso are again slow to react and cover the space. Chelsea defended with a back five, with Willian dropping to support Fabregas and Kante in midfield.  Eden Hazard drifts central to add another layer to the defensive structure and offer a key counter-attack point for Chelsea – but this set-up was largely ineffective in the first half. 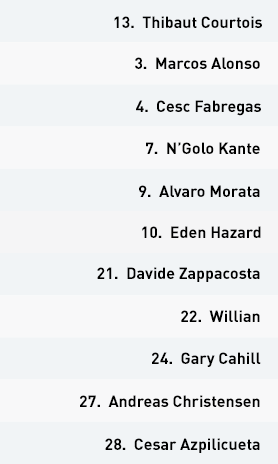 Zappacosta makes a run centrally in behind the Southampton defensive line, but with Willian and Hazard central, Fabregas has no options out wide when he receives the ball. Azpilicueta is joining high, but this also contributed to Chelsea’s structural problems defensively. Despite having been in control of the game, Southampton lose focus when Fabregas takes a quick free-kick to Marcos Alonso. Substitute Olivier Giroud takes advantage of the space behind Southampton’s three central defenders. Alonso delivers early and Giroud takes his run off the shoulders of the defenders to finish with his head. 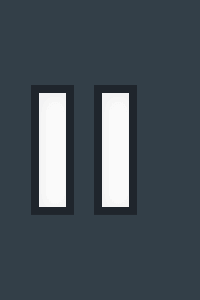 Willian, now in a wing-back role following a tactical switch, gets one-on-one with opposing wing-back Cedric Soares for the first time in the game. The clever movement of Kante and Giroud creates space for Hazard to finish after Willian had beaten his man and delivered into the box. Giroud’s winning goal was scored following a quick free-kick by Willian. Hazard was given too much space inside the penalty area to supply the cross for the striker – who, unmarked, had smartly dropped into space. Chelsea started in their customary 3-4-3 system, Davide Zappacosta replacing Victor Moses at right wing-back in the only change from their draw against West Ham. Willian and Eden Hazard took up similar roles to Southampton’s James Ward-Prowse and Dusan Tadic in supporting the main striker, Alvaro Morata. Chelsea struggled to cope with the physicality, intensity and attacking intent of Southampton in the early exchanges of the game. Getting the ball in between the lines to Willian and Hazard, who were well-marked, was clearly a priority for the visitors, but there was an overreliance on the pair to create opportunities. With their options ahead so limited, N’Golo Kante and Cesc Fabregas frequently took too many touches on the ball, resulting in slow and forced passes into central areas – which invited Southampton to counter-attack. Southampton attacked with greater intensity and purpose as their confidence in the first half grew – and Chelsea couldn’t cope with their quick transitions. Marcos Alonso failed to track back for the first goal, leaving too much space in the penalty area for the hosts to exploit. Chelsea also lacked width, with Alonso and Zappacosta not maintaining their position on the touchline well enough. 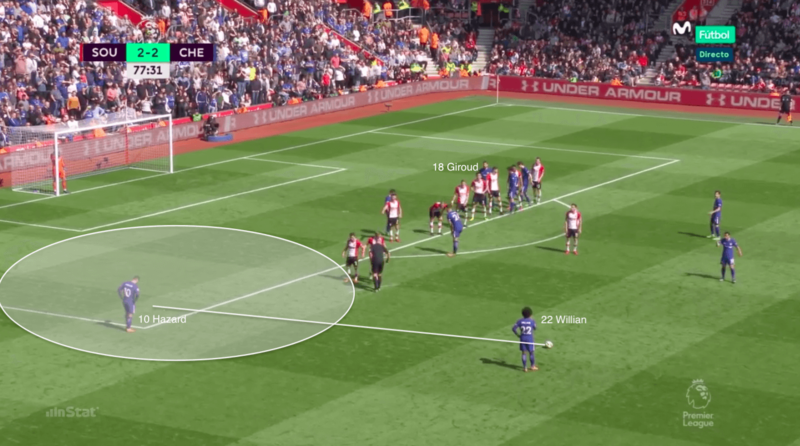 When they did, Southampton moved their block quickly to prevent Chelsea exploiting the space. 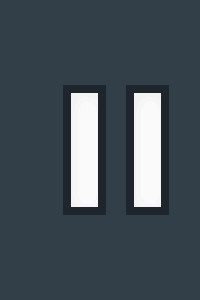 This vastly limited Chelsea’s options in possession. Chelsea defended with a back five, with Willian dropping deep to help Kante and Fabregas in midfield, and Hazard staying forward in central areas as an option on the counter. Chelsea’s best opportunities came on the counter-attack, but when they were forced to defend pressure on Southampton midfielders Oriol Romeu and Pierre-Emile Hojbjerg was poor. The Saints pair were able to comfortably switch the attack out wide, causing structural problems to Chelsea’s back line. Conceding a second goal forced Chelsea manager Antonio Conte to make key changes to his side, with an immediate double substitution seeing Olivier Giroud and Pedro replacing Morata and Zappacosta. Pedro played as one of the front three, with Willian dropping in at wing-back to offer greater attacking threat in wide areas. The introduction of Giroud had a noticeable impact on the Southampton defenders, who were intimidated by his physical presence. The striker’s ability to retain possession and compete for long balls crucially allowed Chelsea to play over Southampton’s midfield block. Within nine minutes of his introduction, Giroud instinctively made a run in behind Southampton’s disordered defensive line to score from an Alonso cross following a quick Fabregas free-kick. Momentum had now shifted in Chelsea’s favour, and they expertly exploited Southampton’s vulnerability with further goals from Hazard and, again, Giroud. Chelsea’s problems for large parts of the game were clear, but Conte’s introduction of Giroud and a tactical switch to play Willian at wing-back were decisive in giving the away side a new attacking dimension that Southampton couldn’t contain. 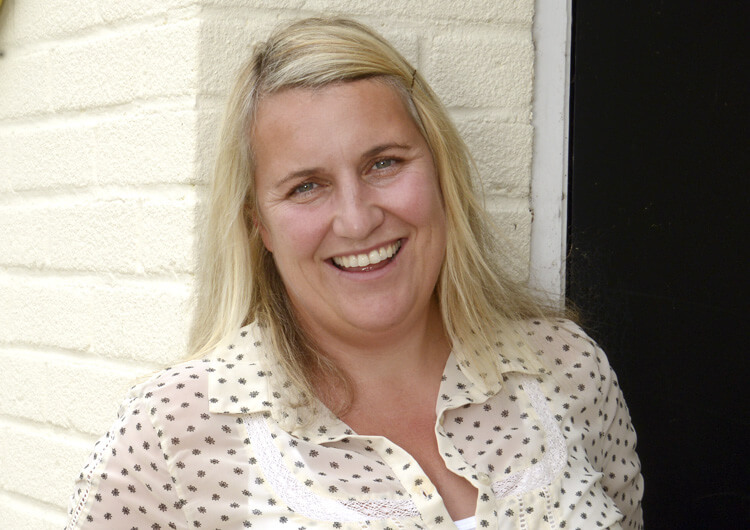 Southampton had control of the game for 70 minutes. Chelsea were denied opportunities to penetrate through central areas and, when possession was regained, the home side countered effectively through Shane Long, Dusan Tadic and James Ward-Prowse. Southampton were the aggressors, winning the majority of the duels and playing with a greater intensity than Chelsea. Southampton created good opportunities in wide areas, particularly on the left through the combination of Ryan Bertrand and Dusan Tadic. 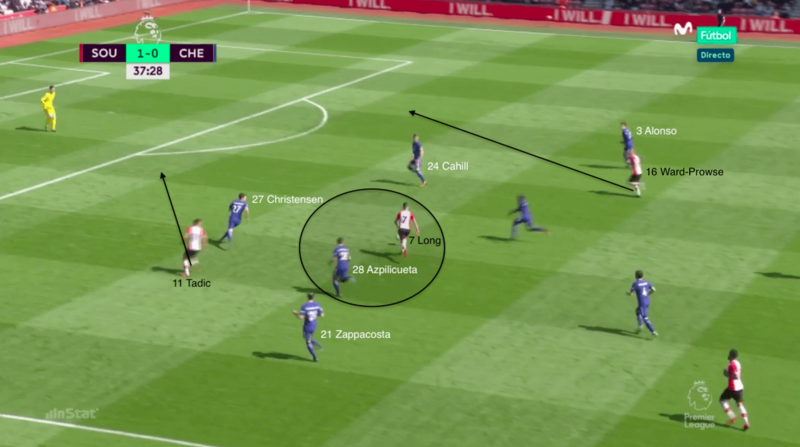 The dynamic nature of Southampton’s wing-backs caused Chelsea difficulty, and on more than one occasion spoiled the balance of Chelsea’s back line by dragging Cesar Azpilicueta out wide. The introduction of Olivier Giroud had an immediate impact, with his physicality allowing Chelsea to take more initiative in the game. The striker effectively competed for long balls forward, offering Chelsea an alternative route to goal in playing over Southampton’s midfield block. 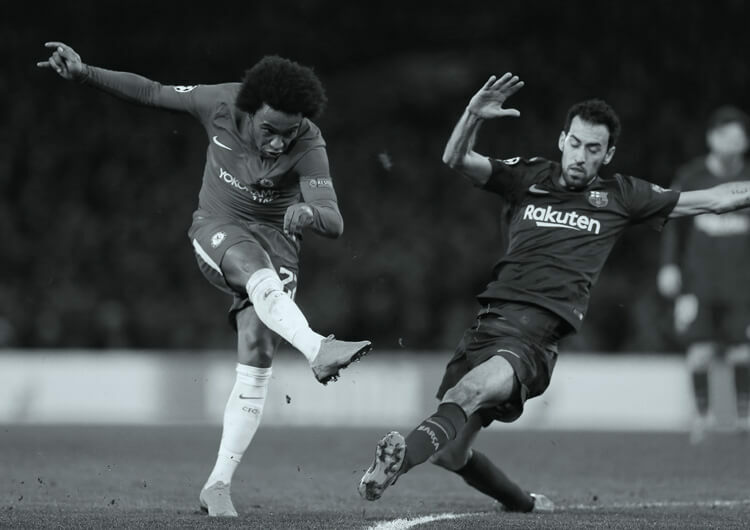 The tactical switch of Willian at wing-back after Pedro had replaced Davide Zappacosta gave Chelsea a new attacking threat in the wide areas. Willian’s willingness to attack one-versus-one and move into attacking positions pressured Southampton. 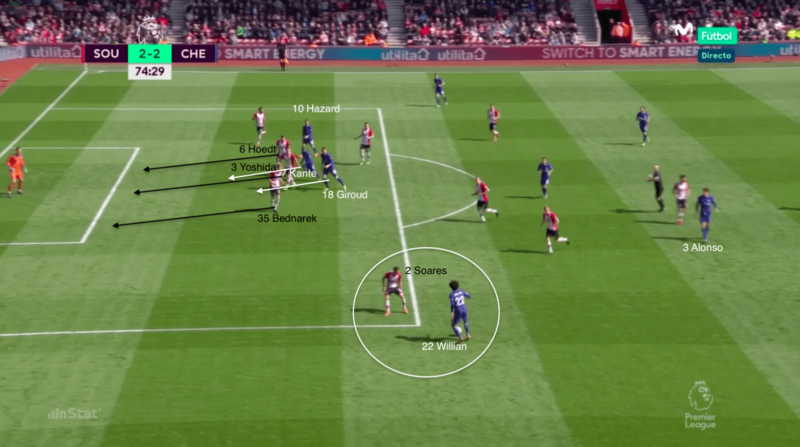 A lack of width going forward combined with Southampton’s disciplined central block had left Chelsea frustrated at a lack of attacking options before this switch tactically. 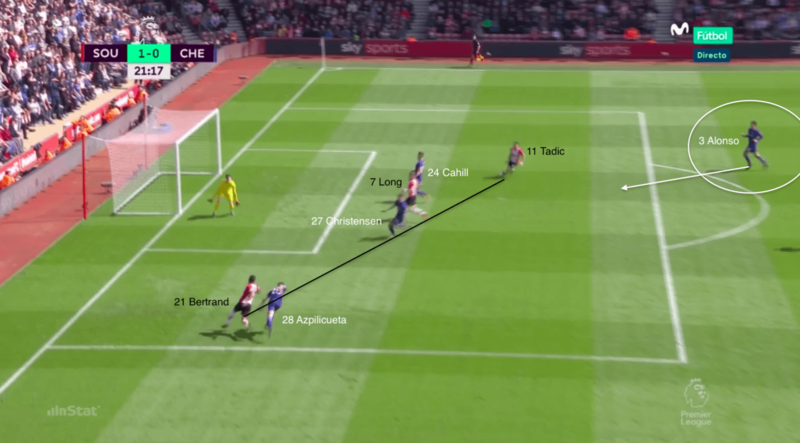 After Olivier Giroud’s first goal, the psychological challenge for Southampton to stay calm and focused was tested, as Chelsea took momentum of the game and increased pressure. Southampton failed to regain their authority, and within 10 minutes their early defensive work had been undone. The late introductions of Charlie Austin and Josh Sims had little impact.